Investigators believe a woman furious about her missing cell phone may have set a fire in a Manhattan apartment building that injured three early Friday. The fire broke out just after 1 a.m. Friday on the eighth floor of the 18-story building at 109th Street and Lexington Avenue, the fire department said. The fire was brought under control in about 45 minutes. Two people had minor injuries. Another man is in critical condition, according to officials. Police say a man and a woman were in the apartment apparently arguing over a cell phone. When the 21-year-old woman couldn't find her phone, in a rage, she set fire to a pile of clothes with a cigarette. Neighbor Stalin Maldonado said his friends were also in the apartment with their 1-year-old baby daughter, and heard the cries for help. "'Somebody help us, there's a baby in here!'" he recalled hearing. "'Help us, help us.'" Other neighbors said they stayed in their apartments as thick black smoke enveloped the hallways and seeped into the elevators. "I heard somebody screaming outside, and we opened the thing there was smoke and we closed it," said Angel Quiles. "It was dark, very dark." Maldanado couldn't believe the arson allegation. 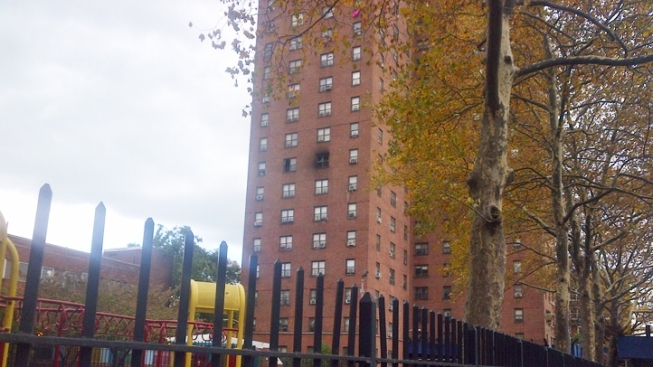 Thousands of people live in the high-rise building, part of the DeWitt Clinton Houses. "It's not just that apartment that could have been destroyed," he said. "That's crazy." The woman who allegedly set the fire was being questioned by police. Police have not yet announced any charges.